Originally built in the 1800's, this cottage has been restored and extended to provide a high standard of accommodation. Electric wall mounted heaters and wood burner in sitting room. 12 acres of mature gardens and forest and 10 acre field. There are several golf courses within a short distance. Complimentary heated Jacuzzi in private garden for use between 10am and 9-30pm on request. Please ask for details. Guests are welcome to have a go at clay pigeon shooting in the grounds, with instruction from Mike who has more than 35 years experience. Please ask for further details. The cottage had everything we needed it was clean and tidy and the hot tub is a great bonus. Lots of walks right from the door our dogs had an amazing time. Janet and Michael were great supplying us with plenty of wood for log burner and telling us about local walks. It was lovely meeting you all and that you enjoyed the cottage. Thank you for booking with us and you are all very welcome anytime. This was our second time staying at the cottage and it was as beatifull as the first. The cottage it very clean and well equipped, with plenty of clean towels and toiletries. The hot tub is a luxurious and welcomed extra to the cottage. It is immaculate and chemicals are checked daily. The views from the hot tub are breath taking, it's truly relaxing. And the owners.....well where do I start? Mike and Janet are 2 of the nicest people we have ever met. Nothing is too much hassle, from information regarding the local area to offers of lifts to and from town. Can not wait to go back next year, this time with the children. A last minute booking for the end of the half term. The cottage was beautiful and in a quiet location with great views. The cottage was clean and very well presented. There are many attractions worth visiting fairly close to the cottage such as the Big pit coal mine tour and museum in Pontypool, which is also free, is well worth a visit. We took our 2 dogs and there was great walks by the cottage and a large reservoir is a short drive away which can be walked round although we did visit the reservoir but didn't attempt the long walk round it. Mike and Janet were the perfect hosts and nothing was too much for them and were there to help with anything. One of the main attractions at the cottage was the hot tub, which Mike happily showed us how to use, which we did every day. It's in a perfect location to see the views over the hills and in the distance the Brecon Beacons. We really enjoyed our break, the cottage and the hosts and have already booked a week in the summer. Thank you Lynn for the wonderful review. We look forward to seeing you, Roy and Charlie August 2017. We have just returned from a three day break and feel refreshed, relaxed and ready to face the world again. The cottage is beautiful, extremely clean and very well presented. The location is stunning and the views are absolutely breath taking whether it be fine or overcast. The directions to the cottage were very clear and easy to follow. The cottage is well positioned to visit many surrounding attractions – a beautiful reservoir is a short drive away. Or if you enjoy walking, there are an abundance of routes to suit all abilities just on the doorstep. Nothing was too much trouble for Mike and Janet. They were generous hosts who went the extra mile to ensure we enjoyed our break to the full. 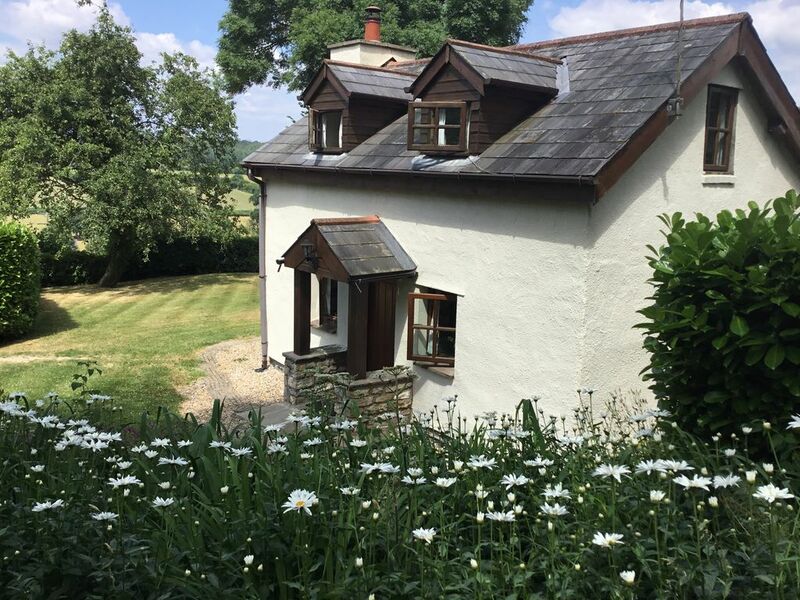 Although we didn’t use the hot tub, it is in a perfect location just above the cottage to enjoy an amazing panorama of the Welsh countryside. The clay pigeon shooting is also definitely worth a go. We would unreservedly recommend this property and plan to visit again in the near future. Dear Rosemary and Ian, thank you for a lovely review. It was a pleasure for us to have such a nice couple staying in our cottage. We are delighted you both had a relaxing few days to prepare for the return to work and sincerely hope you will return when time permits. kind regards. Just spent a week at this lovely cottage which benefits from being in a stunning location. You have to try the hot tub. Had great weather but you get a feel whatever the weather or time of year it still be stunning. If you are going with the dog ( forest on the door step , owners are dog lovers so are more than happy to advise where to go. ) or just enjoy walking there loads, never got to go to all the places I had planned. ( good excuse to go back ). The owners Janet and Mike are a lovely couple and are very approachable. Thank you Michael for the kind words. It was a pleasure for us having you staying in our cottage and you will always be welcome here. Outstanding views over pasture land incorporating the Usk Valley. Close to a number of golf courses. Great for ramblers, hikers and cyclists. Short easy drive to local amenities, Cardiff is less than 30 minutes by car. Big Pit , Sugar Loaf mountain and Breacon Beacons are all close to hand. If you fancy a try at clay pigeon shooting, we have the facilities within our grounds with all equipment included and instruction by Mike who is an experienced competition clay pigeon shooter. The cottage has Wi-Fi. A deposit of £50.00 is required to secure the booking. The remaining to be paid 4 weeks before the start date booked.